We’ve spent a week in perpetual deluge here in Southern California. 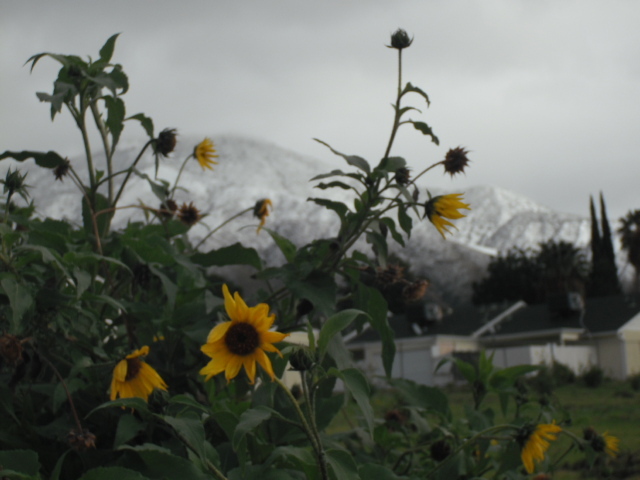 Yesterday, the rain finally stopped for a minute, and the foothills got to show off their new snow line. The sunflowers were a little stunned. They thought it was Spring already. I was fooled too. Just a few weeks ago, I had been flip-flopping around the neighborhood in capris and short sleeves. But it’s been shoes and socks and hoodies these past several days for me…standard winter gear for Southern California. Yesterday was a pretty good day. I have a little hangout spot where I spend a few minutes each day before going to Starbucks to get my head on straight, listen to a little bit of music, and just generally prepare for the day ahead. I tend to get a lot of ideas there. Plus, I like the view. Anyway, by the time I got to Starbucks, I had loads of ideas fresh from the ether. More than usual. I spent 15 minutes transcribing all the notes I had scribbled on a Wal-Mart receipt. Good stuff though. 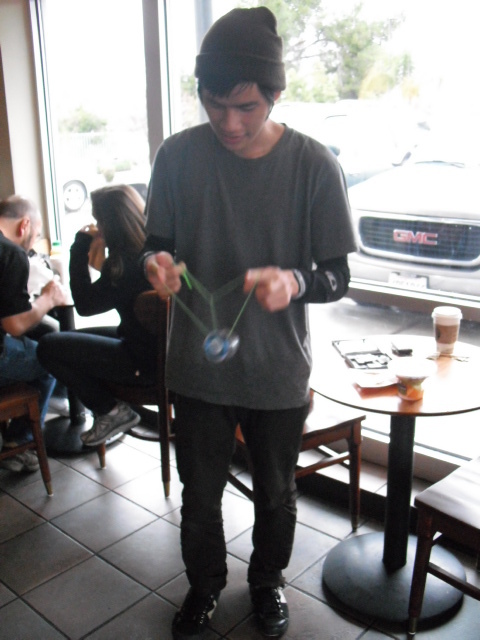 And in the dining room at Starbucks, there was a sweet kid who spent a good 40 minutes spinning magic with a yo-yo. I finally had to get up and make his acquaintance. This is Jeff. He’s been yo-yoing for 7 months — he’s says it’s an Asian thing <g> — and he looks like Olympic gold doing it. It killed my word count, but I’m glad I caught the show. As of today, I’m still working on Sunday’s short story. It’s been progressing like molasses rolling uphill, but it’s picking up speed. Got in 1,100 words so far today. It’s kind of fun working at this pace. I hope to finish the first draft tonight. I’m at the part where my protagonist realizes exactly what it is he’s been feeding in his garden and he’s thinking maybe not such a good idea. Lots of fun. In other news, I’m just about done organizing my home office space. I hope to post about that either tomorrow or the next day. It turned into a much bigger project than I had envisioned, but more about that later. In the meantime, I hope everyone reading this is having a fine time in this fine month of January. Are you all writing? If you are, I’m here cheering ya on. Rah-rah-rah! I guess it is an Asian artist thing. My friend, Stitchmind, can always be found lurking in the corner of a dark nightclub, yo-yoing away.